Homemade Oreos made with chocolate wafers. Make homemade Oreo cookies at home with 5 easy ingredients! Customize the buttercream for your favorite flavored Oreo! So, the other day I was searching for just the right brand of graham crackers (there is only one correct one, you know), and I couldn’t help but notice that every single person in the cookie aisle grabbed a bag of Oreo Thins as they passed me. Literally, every single person. I’m starting to think they sprinkle crack on one side of the Oreo, because it seems people are obsessed! But, I won’t buy ’em. I’ll make them myself, and in, like, 5 minutes, too! You know those chocolate wafer cookies that are used so much in no-bake desserts? I put a photo of the box above just for reference. You also typically buy these wafers around Christmas to make Thin Mints or other quick chocolate-dunked lovelies. Well, when you stuff them with a buttercream that tastes like Oreo filling, you have quick, homemade Oreo thins! I saw homemade Oreo thins on Thirsty For Tea’s site made with matcha, and after devouring them (I have a serious matcha dessert problem lately…see: matcha tiramisu), I knew I wanted to make them for you, small-batch style! Because we are NOTHING if we don’t limit our Oreo intake. 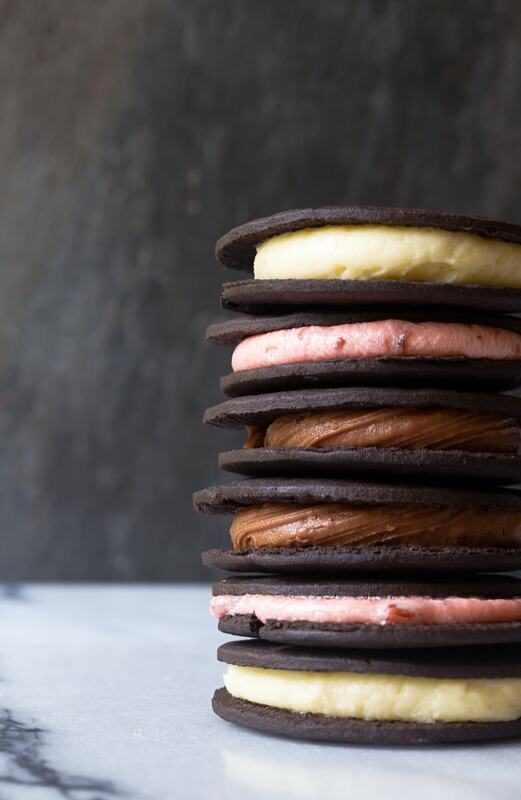 We’re doing vanilla, strawberry and chocolate Oreos today, and you can definitely double stuff them, if you like. Of course you like that. I know you. The Oreo on top is lookin’ a little double-stuffed, no? Each flavor of buttercream makes enough to fill 10-12 cookies, so if you make all 3 flavors, you’ll have 30 Oreos on your hands. That’s a little too dangerous, and I don’t think you should do that. 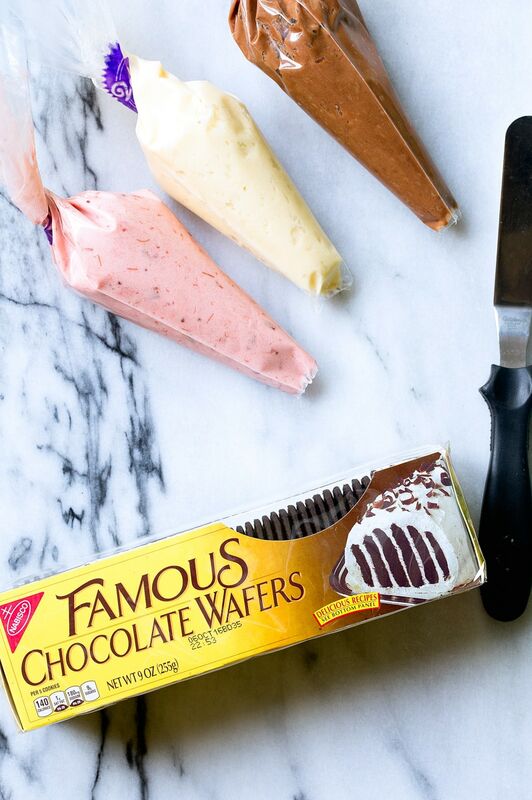 Instead, store the chocolate wafers in the freezer and make one filling at a time, as your craving strikes. You could also double stuff your homemade Oreos with two different flavors! 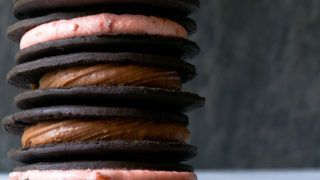 One Oreo with a layer of chocolate plus a layer of strawberry filling? Yes, please. 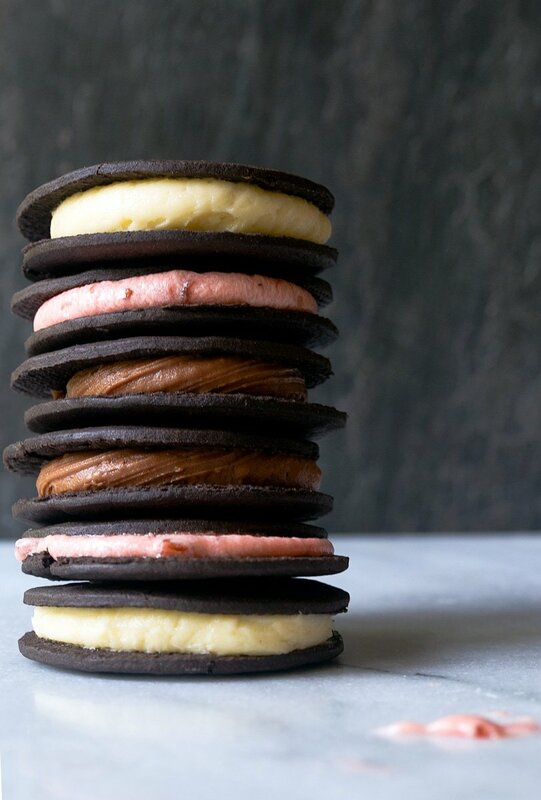 That would make us Neapolitan homemade oreos, I believe! If you dunk them in chocolate, you will go to jail. Each flavor of buttercream makes about 10-12 cookies, so lay out the number of cookies you want to make. Make each buttercream filling separately: beat together all of the ingredients, adding milk if necessary to make a thick buttercream. (I found only the plain flavor needed milk to come together). 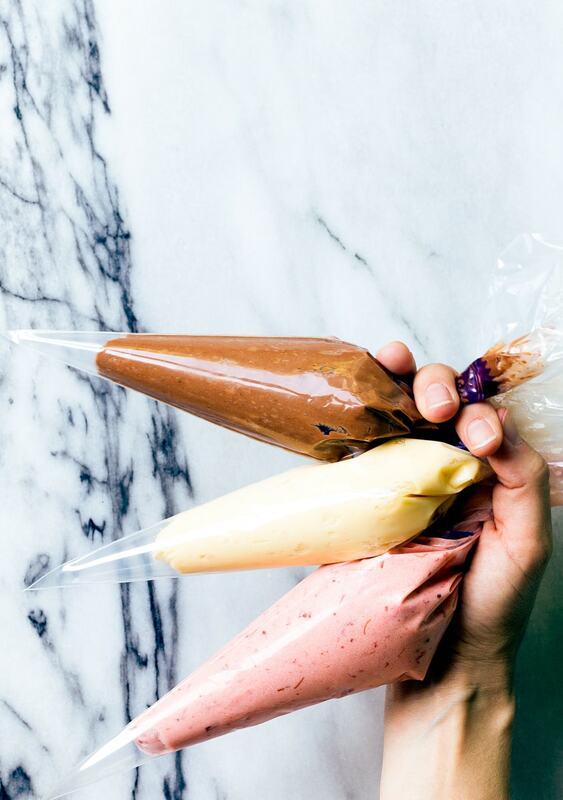 Move the mixture to a piping bag (or a plastic bag with the tip cut off). Pipe a walnut-sized amount of buttercream on one cookie. Top with another cookie to sandwich together. So fun following you on snapchat and getting to see all these desserts in progress. Major impressed at how quickly you get your posts up, too! I love this idea Christina – I’m definitely doing that. I had no idea they’re not making them skinny! I just saw yesterday blueberry Oreo’s in an ad. What will they think of next? Thanks for sharing this. I meant I had no idea that they are making Oreo’s in a skinny version now! If you have not tried them Oreo Mint Thins, you must. They taste so much like Girl Scouts Thin Mints without chocolate covering them. With this, I can do that. Oh and with orange cream. Yum. Thanks so much. There have been recent scientific studies that gave rats a choice between crack and oreos (after being exposed to both) and the rats chose oreos. It affected the same pleasure center as the drug. So you were spot on with your comparison. That goodness for your small batches. hey girl so creative! Yummy! I haven’t tried the Oreo Thins yet because I’m perfectly happy with the “fats” :) Butttt that gorgeously colored and flavored cream filling is winning me over!! I love those wafers and can’t wait to try this! I think I’m going to jail though…the chocolate dipping is calling my name! This is ridiculous. I thought this was going to be a recipe to make an oreo, not make frosting that is vaguely similar to what oreo frosting might taste like. Next time, properly label your so-called “recipes”! Well, that’s why they’re called easy? Chill. in response to anon’s comment: waaaay to be brave and leave a rude comment about a sweet little nothing ANONYMOUSLY. in response to christina’s comment: staying cool in the face of ridiculous snarkiness; love it! I love this. Do you think that this buttercream recipe would work on cakes for a small batch as well? If so, how many cups do you think this recipe makes? Thanks!